Our first flight of the day is an hour late - so far. 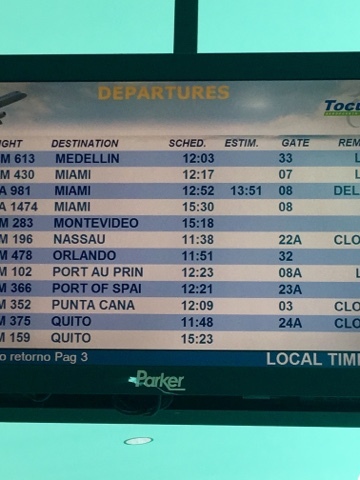 We can still make our connection at Miami if there aren't any additional delays: PTY-MIA-LAX. We did have the "entertainment" of having to through a metal detector, bag X-Rays, and random fondles, er, pat downs, right at the gate. They didn't like Kathy's wearing sunglasses, and we didn't find out that they'd been dropped loose into the bin next to her bag until after we'd gone through the metal detector. Fortunately, they don't seem to be damaged. We know the U.S. requires these procedures of airlines flying into the U.S., but this was about the worst we've experienced, with the possible exception of India.